It is entirely possible that this Hill’s popularity has risen with because of all the picture sharing sites and applications. The photographs here are just incredibly pretty. The hell itself is a flowing wave of green grass, very peaceful to look at. Once you actually climb onto it, look down upon acres and acres off rice paddy fields. Definitely avoid coming here during overcast or rainy days as that would just ruin the pictures. You will find the remains of an old tree on top. A popular photo opportunity is to have yourself sitting on the curve of the tree trunk with the landscape laid out in front of you. 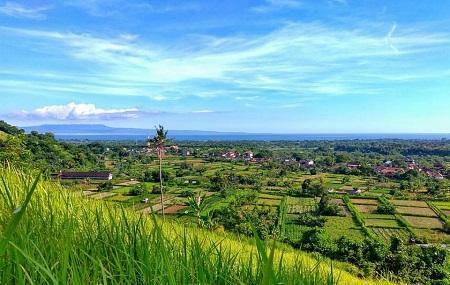 Also, visit the popular attractions in the city by following Bali itinerary 4 days. How popular is Bukit Belong? People normally club together Blue Lagoon Beach and Bali Safari And Marine Park while planning their visit to Bukit Belong. It’s just a hill, nothing special, but you will be charged again. Don’t waste your time for this. Beautiful view.. Actually we were just curious about this place because it was so green from far. When we arrived, The guys at the gate ask us to pay 20K, meanwhile it shouldn't have any entrance ticket.. You need to climb and get your feet ready. The grass makes my feet itchy. But worth to visit. Nice for weeding fotography or other job for take a nice background view.